So here we go, Dragon team strategy. If you want a refresher on how we chose this team, readthe first article here. If you just want a team lineup, click here.No funny or witty intro this time around. Let’s dive right in. Remember, we didn’t bring any true ramp with us. All of our efficiency is going to come from reducing our own purchase costs and triggering things to field for free. So these first two turns could be a little shakey, but by turns three and four, we should be rocking. Turn one: Best case scenario, we get two bolts, a Sidekick, and any other energy. We field the Sidekick. Then use Blue-Eyes White Dragon’s global, to pay a bolt and KO one of our own monsters (we KO that sidekick we just fielded.) to reduce the next die’s purchase cost by two. So now, let’s buy that Half-Dragon at a reduced cost for only two energy. We could just straight up purchase the Half-Dragon for four energy if we don’t get a Sidekick, but this lets us get a die to our prep for next turn as well. Alternate turn one: If your opponent has either PXG or the basic action Resurrection, you could do this instead. Get two bolts, a Sidekick, and either a mask or shield (mask for PXG, shield for Resurrection). Field the Sidekick, used the BEWD global, paying a bolt to KO it and reduce the cost of Baby Dragon by two. Spend one bolt energy on Baby Dragon. If you’re using Resurrection, use that global with your shield energy now. If you’re going to use PXG, wait until your opponent’s turn to use it. Turn two: Assuming we just went with our “Turn one” strategy without having opposing globals, we are still rolling five dice on turn two. 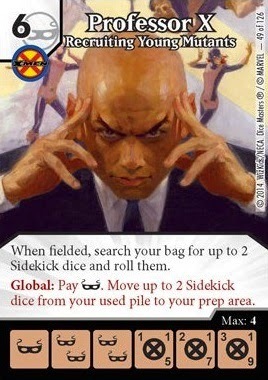 The “field a sidekick and spend a bolt on BEWD’s global” is going to be a common theme here. Our ideal turn would be three Sidekicks and two bolts. We will field all three sidekicks, use one bolt on the BEWD global, KOing one of our Sidekicks. Do that and let’s purchase Baby Dragon for a single energy. (If you purchased Baby Dragon early on, now get the Half-Dragon this turn). Having two Sidekicks in the field does a couple things for us. It gives us a target on future turns to use the BEWD global and it also gives us some early blockers. This team takes a few turns to really get going, so you might need those early blockers. If you don’t get ANY sidekicks, good luck. With five energy, I’d probably lean towards the Curse of Dragon, so no energy is wasted. If your opponent has Resurrection or PXG, you may be able to buy your Baby Dragon and use those globals. Turn three: Ideally, we used the BEWD global last turn, KOing one of our sidekicks, so we are rolling five dice again this turn. Let’s say one of them is the Half-Dragon we purchased on our first turn. Luckily he’s on his level one side, and our other four sidekick dice all came up energy. Let’s look at numbers for a minute. We have two Sidekicks fielded, four sidekick dice and our Half-Dragon in the reserve pool. That means we have two sidekick dice and our Baby Dragon still in our bag. We will be refilling our bag before our next roll. So anything we purchase will not be in the used pile next turn. To get the most bang for our buck, let’s field our Half-Dragon. With our four remaining energy, let’s buy two Baby Dragons for two energy each, thanks to Half-Dragon. Turn four: Wedraw the two sidekick dice and Baby Dragon from our bag, refill, and draw another sidekick.Baby Dragon is on level one and the sidekick dice are all energy. You ready for this? We spend a bolt on the BEWD global, KOing one of our two fielded sidekicks. We spend our other two energy to purchase Curse of Dragon. The BEWD global reduced its cost by two, and the Half-Dragon we have in the field reduced its cost by one, making this five cost character cost only two energy.Then, we field our Baby Dragon. This triggers our Half-Dragon to deal one damage to our opponent. This also triggers the Curse of Dragon ability, letting us roll any Curse of Dragon dice in our used pile, and field any that show a character face for free. Boom, it comes up a character face. We field it for free, which triggers the Half-Dragon’s ability again, dealing a damage to our opponent. Feel free to attack with the Curse of Dragon, because you know you have three sidekick dice and two Baby Dragons still in your bag. You WILL be rolling a Dragon next turn. If the Curse of Dragon gets through and goes to the used pile, you might be fielding him again for free again next turn if you field another Baby Dragon. The biggest thing with this team is to pay attention to when your dice bag will refill, because keeping your Curse of Dragon dice in your used pile is critical. -If your opponent wants to field a lot of low cost characters and Sidekicks, the Blue Dragon is a good early option only costing three energy, once the Half-Dragon hits the field. In some instances, it may even be smart to purchase the Blue Dragon on your first turn, instead of the Half-Dragon, but I think that would only happen if you are familiar with your opponent’s strategy. -If your opponent is relying on manipulating your characters through globals or basic actions, you have to go for the Lord of D. early on. You can make sure he’s on his burst face through spinning him down with the Polymorph global we brought. -If your opponent has PXG, making big buys early on a real possibility for you, your winning combo may be Half-Dragon, Blue Dragon, Dracolich. Field Dracolich and buy Magic Missile for free. The Half-Dragon’s ability triggers to damage the opponent. Roll Magic Missile. If it’s an action side, use it to damage your opponent. The Blue Dragon’s ability triggers and deals all characters one damage. Attack with both Blue Dragon and Dracolich, triggering both of their breath weapons. This does two more damage to your opponent and gives the second and third damage to each opposing character. Then the dragons get through for damage. That scenario I just described, if both dragons are on level three, did three damage to every opposing character and 19 damage to your opponent. So go ahead and let your opponent bring some extra ramp possibilities to the game, you will be prepared. -Your opponent might know you have a team full of dragons, and decide to bring some D&D; adventurers to gain the experience. Just stick to your Yu-Gi-Oh dragons like Baby Dragon and Curse of Dragon. Those do not give your opponent experience. -Go for the Half-Dragon! Force it to attack. Force it to block. Just straight up KO it any way you can. The Half-Dragon is how this team ticks. Maybe even lock him down with Loki Gem Keeper or capture him with a Gelatinous Cube. Every second he is not in the field, the Dragon team moves slower. 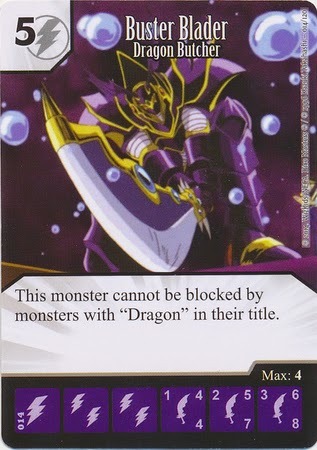 -The Yu-Gi-Oh common Buster Blader Dragon Butcher will make things very difficult on the Dragon team. 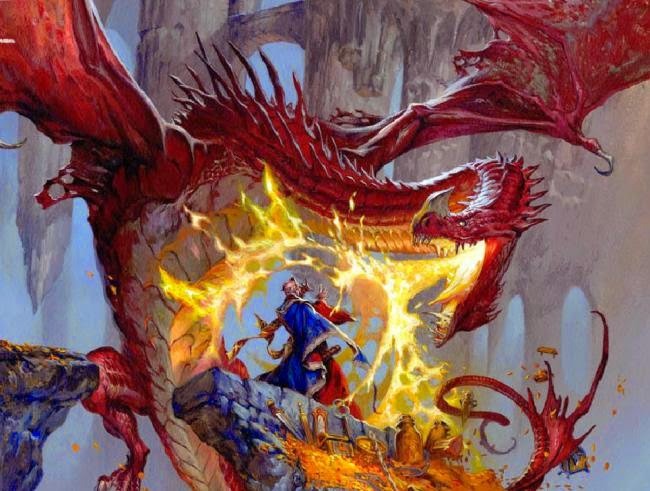 If you attack with him, the only things that can block him are Lord of D. (definitely not a dragon), Half-Dragon (maybe he can’t, but I think Wizkids implied the hyphenated “-Dragon” in the name is not the same as having “Dragon” in the name.) and Dracolich. Dracolich is the oddball here because he is very much a “Dragon” according to Wizkids, but he definitely does NOT have “Dragon” in his title. The Half-Dragon and Lord of D. are much more affordable options for your opponent to block the Buster Blader, and both of those characters are ones they want to stay fielded at just about any cost. The Buster Blader has potential for six attack, and that’s just a little more than most players are comfortable with letting through to see a character leave the field. Attacking with Buster Blader Dragon Butcher will definitely force your opponent to make some tough decisions. -Lord of D. only makes it so characters with “Dragon” in their name cannot be the TARGET of action dice or abilities. So action dice and abilities that affect all characters and do not target anything specific are fair game. Plus, they are already bringing the Red Dragon with a global to make purchasing those action dice easier. For instance, I’d love to see the look on a player’s face if I used Prismatic Spray Greater Spell and turned every character down to 1A/1D. Then used some kind of action or ability that damaged everything. Then field my own character or two and waltz right through unblocked. 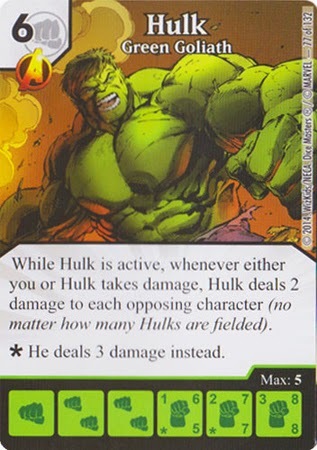 Hulk Green Goliath is a character that can damage all opposing characters without targeting. Also, his ability triggers when you are damaged, and this dragon team loves to deal that direct damage. Hulk smash dragons. So what do you think? I understand that this Dragon team probably wouldn’t finish very well in a super competitive scene like the upcoming Dice Masters National Championship, but in your own local scene, or even just casually among friends, this could be a very fun team to use. As always, leave your comments below, and let me know what you think. And roll on.